In questo articolo il professor Edward Nunes, docente della Columbia University, analizza brevemente il fenomeno dell’alienazione genitoriale e lo colloca nel contesto delle contese conseguenti alla separazione dei genitori. Nell’articolo viene anche affrontata l’annosa querelle sul presunto utilizzo del concetto di sindrome da alienazione genitoriale contro le donne per scagionare uomini accusati di abusi o di violenza contro le donne e i bambini. A questo scopo il professor Nunes commenta il testo di una risoluzione presentata nel 1997 alla Camera dei Rappresentanti dalla signora Constance A. Morella deputato del Maryland per impedire che i casi di alienazione parentale vengano presi in considerazione dalle Corti sulla base di un superiore interesse del minore. Il professor Nunes mostra come l’iniziativa della signora Morella appoggiata dalla National Organization for Women rappresenta un tentativo di estorsione che non può essere rappresentativo né delle donne oneste né del femminismo. Per provare l’ovvietà del fatto che ogni bambino è facilmente condizionabile cita infine una ricerca sperimentale risalente al 1913 in cui John B. Watson aveva dimostrato come le reazioni psicologiche di un bambino possono essere plasmate con metodi simile a quelli sperimentati da Pavlov. Parental Alienation Syndrome (PAS) is a collection of behaviors where one parent turns a child against the other parent. So when one parent deprives their child of a healthy relationship with the other parent, the child may experience chronic psychological distress leading to the deterioration of the parental relationship. Since distress can affect physical health, health care professionals must not overlook the possibility that the child has been subjected to abuse by the custodial parent. Blocking or inhibiting contact with the children – The custodial parent blocks or discourages contact between children and the other parent. The most heinous word in family law is ‘visitation’. With this word, the non custodial parent and his (or her) children become mutual guests under the oversight of the custodial parent and the courts. Only a father can imbue certain intangible qualities to his children that a mother cannot. The corollary that a mother can imbue intangible qualities is also true. Children benefit most when their parents work and act together for their children, rather than two biological parents in conflict acting separately. This is the well-known phenomenon of synergism where the sum of the efforts of persons working together is greater than the sum of each person working alone. This is also called teamwork. Berating the other parent in the presence of children – Comments such as ‘your mother is no-good’ or ‘your father has abandoned us’ are degrading to the child who respect the parent. What the controlling parent is saying to the child is that their feelings toward the other parent are wrong. The controlling parent’s intent is to berate and change the child’s view of the other parent. This conflict between the controlling parent’s demands and what the child knows and believes can lead to later conflicts in the child’s life. Threatening children with withdrawal of home, love, and support – J. Michael Bone and Michael R. Walsh came up with a simple statement. “My way or the highway.” That says it all. What the controlling parent is saying is that the child must think the way I do, believe as I do, and feel as I do or else! The ‘else’ word is a threat. Teaching or forcing the child to fear or reject the other parent – The most prevalent tactic is coercion. Through repetition, the controlling parent relates false accounts of abuse by the other parent. When repeated, this deception can become accepted fact that replaces the child’s own true experiences – my way or no way. This tactic is not acceptable. A similar tactic is that the instigator tells a child that they cannot have contact with the innocent parent unless the child admits that he or she abused them. This is a guaranteed losing strategy for the child and the innocent parents. When the child is forced to admit that abuse occurred then the child cannot have further contact. This is called Catch-22, or my way or no way. The problem is that many courts ignore false allegations against fathers and men. False allegations of domestic violence and child abuse are common in family law proceedings and the person making the allegation (predominately female) far too often succeeds. This is a low risk tactic because the courts rarely hold false accusers accountable for their conduct. I have found that mediators, social workers, police and probation officers extensively quote the accuser and ignore the facts given by the falsely accused person. Worse, they deliberately fabricate statements and then attribute these fabricated statements to the falsely accused party. I have seen sixty-three (63) separate occurrences where such persons used the same text and just filled in the blanks, changing only the name. Many judges fail to act in good faith and sometimes courts alter signed documents and testimony given under an oath of truthfulness. The core of this issue is that one spouse wants to control the other through child custody and the money and the property they gain to receive. A key factor in false allegations of spousal abuse and in Parental Alienation Syndrome is that the controlling party is incapable of civility and truthfulness about their partner. These abusers are selfish and do not care what their spouse or children feel. A false accusation can give an abusive woman exclusive control of the children and the property. This gives them a nearly insurmountable advantage in the legal system. Our misandrious courts often treat innocent males as the guilty party and do not require proof that an accusation is true. The problem is that false allegations of abuse, even when recanted or proven false, can devastatingly affect the victim and their children. This can bring about permanent physical, emotional, and economic effects. The problem is that those who lie or abet such conduct are rarely punished. So with a stroke of a pen, a female can get her spouse out of her life and assure herself of control of the children. That power extends to her control of her husband, his earnings, and his property. Our support laws are structured to account for household income rather than the ex-husband’s income alone. Child support is taxable to the payer and not the recipient. With those so easily made signatures. The ex-wife can increase her tax-free income from combined incomes of her former husband and his current spouse or a live-in partner. The problem is exacerbated in states having high child support guidelines, high wages, and high cost of living. Higher wages bring higher tax rates yet most payers of child support cannot claim children as dependents. Moving to other states that have a lower cost of living is not an option for non custodial parents because court ordered child support payments remain unchanged. Worse, moving to another region with a lower cost of living may trigger a court review that increases child support payments. Custodial parents can often improve their living standard by moving to states or regions that have a lower cost of living and still collect the same court ordered tax-free child support payments. Child support payments are often based on the extent of contact that the non custodial parent has with their child (or children). Moving away and false accusations are tactics that have exacted larger child support payments. Far too often parents fail to agree in advance on issues about raising children. Furthermore, spouses fail to agree or plan for a maturing relationship where roles and responsibilities change. When parents are in conflict about these issues, then Parental Alienation Syndrome can come to the forefront. The public behavior of an abusive parent or spouse can be amiable but their private behavior is often quite different. Abusive parents and spouses use fear and reprisal. When a parent’s interest places control rather than sharing before the child’s welfare, and the child is left between an angry warring person and a caring parent. When a young child has not had contact with the other parent for some time, they can be tentative and shy. None-the-less, shyness is one matter but fear is another matter. In a fear-based environment, the alienating parent attempts to demolish the child’s sense of self-worth such that the child becomes a possession and not a growing living person. It doesn’t take much thought to become a biological father or mother. But when mom and dad work together, their children flourish with abundance that comes from working together in parental synergism. The motivations behind Parental Alienation Syndrome and contriving false allegations of child abuse, child molestation, and spousal abuse are nearly identical. Telling a child “my way or the highway” or telling a husband “I’ll fix you” is wrong and clearly illustrates selfish, abhorrent, and threatening behavior. These behaviors have no place in the home because the former is child abuse and the latter is spousal abuse. The National Organization for Women (NOW) has always objected to the existence of Parental Alienation Syndrome because it is contrary to their own preconceived dogma. I have recently received a report that 50 mental health experts from 10 nations are a part of a larger effort to authenticate Parental Alienation Disorder (PAS). The decision is based upon the major symptoms, the indicators that are essential to the diagnosis, and the minor findings that may or may not be present. So a formal description may specify the minimum number of major and minor findings required for the diagnosis. This means that persons exhibiting a particular syndrome have symptoms and behaviors that occur more frequently than what would be expected by chance. Accordingly, there is an effort to add Parental Alienation Disorder (PAD) to the 2012 edition of the Diagnostic and Statistical Manual of Mental Disorders by the American Psychiatric Association (DSM-V). The National Organization for Women has opposed this effort and rightly so because Parental Alienation Syndrome is not a mental disorder. PAS is a conscious choice, mostly devised by women, to alienate their children from their father and this is where I will figuratively cross the Rubicon. Before I begin, I want to explain what a concurrent resolution is and how it works. A concurrent resolution is much like a personal New Years resolution for there is no punishment for failure. It must be passed by both houses, the House of Representatives and the Senate but not presented to the President for approval or veto. So it does not have the force of law. Years ago, March 13, 2002, I read House Concurrent Resolution 182 by Ms. Constance A. Morella of Maryland. According to the best information, twelve other representatives sponsored this resolution that Morella submitted to the House of Representatives (105th Congress, 1st Session) on October 30, 1997. Later, Mr. Davis of Virginia removed his support as cosponsor of the resolution. The most common definition of a lie is that it is an assertion that is untrue and uttered with the intent to deceive. A lie is also the omission of some fact that is designed to deceive or mislead another in believing that something was so when, in fact, it was not. The elements of omission and deception are not exclusionary for lies can, and often do, consist of omission and deception. Ms. Morella’s House Concurrent Resolution 182 is a factual falsehood and an expression of her own view of herself (in her use of the imperial ‘whereas’, as that of an Empress). A copy of this resolution is on the Internet athttp://thomas.loc.gov/. If available, please use this link to view the official copy. A copy of the HTML text version of House Concurrent Resolution 182 appears below without the navigation tags for they are not a part of the resolution’s text. child abuse, and victims of domestic and family violence. Mrs. MORELLA (for herself, Mr. SCHUMER, Mr. DAVIS of Virginia, Mrs. JOHNSON of Connecticut, Ms. FURSE, Ms. CARSON, Mr. VENTO, Mr. LAFALCE, Mr. STARK, Mr. FROST, Mr. PAYNE, Mr. HINCHEY, and Mr. SANDERS) submitted the following concurrent resolution; which was referred to the Committee on the Judiciary. Expressing the sense of Congress with respect to child custody, child abuse, and victims of domestic and family violence. (3) psychological evaluators not trained in domestic violence ignore or minimize the violence and give inappropriate pathological labels to women’s responses to chronic victimization, including `parental alienation’ to blame mothers for their children’s reasonable fear or anger toward their violent fathers. Whereas many courts and professionals use the baseless parental alienation syndrome to force mothers into joint or shared parenting arrangements or to give custody to fathers, especially when mothers try to protect themselves or their children from men who abuse them or their children. Whereas almost every custody evaluator or judge recognizes how important familiar routines and objects are to a child, particularly in times of stress, but often fails to recognize the importance for the child of maintaining its living arrangement with the child’s primary caretaker parent. (5) States should provide training in domestic violence and child abuse, as they impact custody, child support and visitation determinations, to all professionals who interact with children and parents (including judges, attorneys, guardians ad litem, therapists, mental health professionals, custody evaluators, child protective services personnel, and court appointed special advocates). Please understand that this resolution does not have the force of law but it reveals the lies of the male hating anti-feminist movement lead by pernicious women. This technique has been used by authoritarian regimes throughout history and will continue to be used by those who want to enslave others and take credit for their achievements. It’s much like a bully stealing another person’s jacket and bragging about what they did. This is the surest sign of their guilt. This is issue is about cash, the tax-free kind, where the payer of child support pays the taxes but cannot claim dependency or a deduction. It about the recipient of child support who pays no taxes on that money and still receives the dependent’s tax deduction. As a result, the funds are commingled which often leads to extortion where visitation rights are held hostage by a cruel and indifferent parent. What the National Organization for Women is saying to fathers is contact with your child will cost, how much do you want to spend? Isn’t that a ransom note? This organization does not represent feminism or honest women. According to reports, applied knowledge and research on Parental Alienation Syndrome in the United Kingdom is not at the level that is acceptable to the legal considerations. Moreover, some believe that this syndrome does not actually exist and that is why this behavior does not compel moral action in the United Kingdom. Many legal systems require that the views and wishes of the child must be considered and that is the problem. It presents several undesirable alternatives where a child is forced to choose when this choice is not theirs to make nor should it be. Parental Alienation Syndrome is not a disorder. It is a group of behaviors where one parent turns a child against the other parent. So the child reacts in terms of conditioned response. Once others take sides, they have abandoned the best interests of the child. So the issue is not who is the better parent, in the United States, it’s all about money, the tax-free, garnished kind. This phenomenon is not confined to the parents, but it can include relatives and close family friends. The problem is that once these people take sides, they have abandoned the interests of the child who then becomes a mere possession and not a person. This reminds me of the biblical passage in ‘I Kings 3:26′. 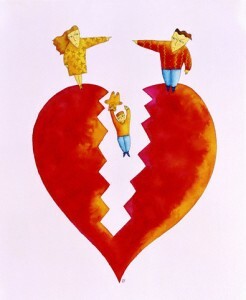 Moreover, distress often leads to the deterioration of the parental relationship. Since distress can affect physical health, health care professionals must not overlook the possibility that the child has been or is being subjected to these abuses by the custodial parent. Imagine this, the estranged parent helps his child with some school work and then after that they spend time together on a pleasant outing. But when the child returns to the custodial home, all havoc breaks out and the child is treated as possession to be punished and that’s when alienation becomes mental cruelty. About 1913, John B. Watson, an American psychologist, demonstrated that children could be conditioned in a similar way. He used a metal bar and a furry animal toy. Each time a child touched the toy, he would strike the metal bar which frightened the child. After a while, the child would become frightened by the mere sight of the toy animal. This led Watson to believe that if anyone could control a child’s environment, then they can invoke a particular response in a child, at will. The Florida Bar Journal, Vol. 73, No. 3, March 1999, p 44-48. False Allegations of Child Sexual Abuse. False Allegations and Munchausen Syndrome and Munchausen Syndrome by Proxy.